PennsylvAsia: Pittsburgh AAPI Town Hall, "United Asian Voices for Regional Economic Empowerment," March 4 in Squirrel Hill. 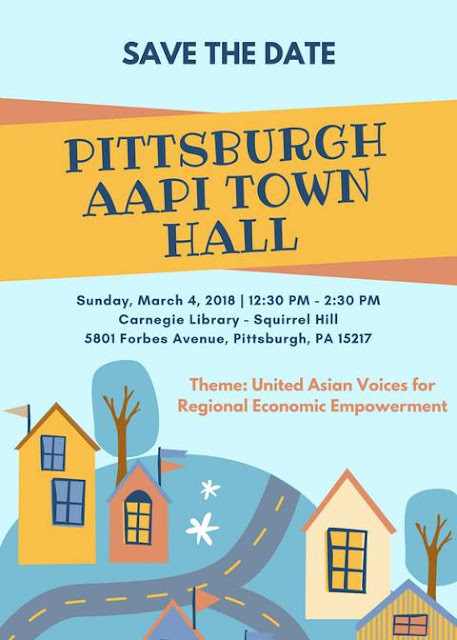 Pittsburgh AAPI Town Hall, "United Asian Voices for Regional Economic Empowerment," March 4 in Squirrel Hill. Pennsylvania Governor Tom Wolf's Advisory Commission on Asian Pacific American Affairs will hold its next Pittsburgh AAPI Town Hall on March 4 on the theme of "United Asian Voices for Regional Economic Empowerment." Please join Governor Tom Wolf's Advisory Commission on Asian Pacific American Affairs (GACAPAA) for an interactive dialogue centered around the theme of "United Asian Voices for Regional Economic Empowerment." GACAPAA is responsible for serving as the advocate agency in the Commonwealth for our diverse Asian American and Pacific Islander (AAPI) communities. In March of 2017, GACAPAA held our first ever AAPI Town Hall in Pittsburgh, and we want to provide you with an update on what we've been up to for the past year. We also want to hear from you! The event runs from 12:30 to 2:30 pm at the Carnegie Library in Squirrel Hill (map), accessible by buses 61A, 61B, 61C, 61D, and 74. It is free and open to the public, though registration is required.